There are many causes of halitosis including tongue coating, periodontal disease, peri-implant disease, deep carious lesions, exposed necrotic tooth pulps, pericoronitis, mucosal ulcerations, impacted food or debris, imperfect dental restorations, unclean dentures, xerostomia and endodontic lesions. , While several pathological conditions such as oral cancer or candidiasis in immuno-compromised patients can result in halitosis, the term physiological halitosis, or physiological malodor is used to describe halitosis in individuals where no underlying systemic cause is detectable. , Halitosis has been attributed to the presence of volatile sulfur compounds (VSCs) such as hydrogen sulfide (H 2 S), methyl mercaptan and dimethyl sulfide. These compounds may be measured using gas chromatography, organoleptic test, sulfide monitoring, quantifying β-galactosidase, salivary incubation, ammonia monitoring, and polymerase chain reaction DNA testing. ,, While there are several studies on the efficacy of different measures available to combat halitosis, there has been little attempt in the literature to quantify the level of evidence present for each method of treatment. The aim of this systematic review is to document the level of evidence available for the use of different modalities in the management of halitosis. The search was conducted electronically in PubMed from 1999 to 2014. The keywords used were "Halitosis" and "Oral and Malodor/Malodour". The studies included human clinical trials with or without randomization and excluded case reports and case series. Only articles written in English were included in the review. A total of 897 articles were identified. Of these, 204 articles were screened. 58 full-text articles were then assessed for eligibility. 16 articles were then excluded since they did not meet the inclusion criteria. 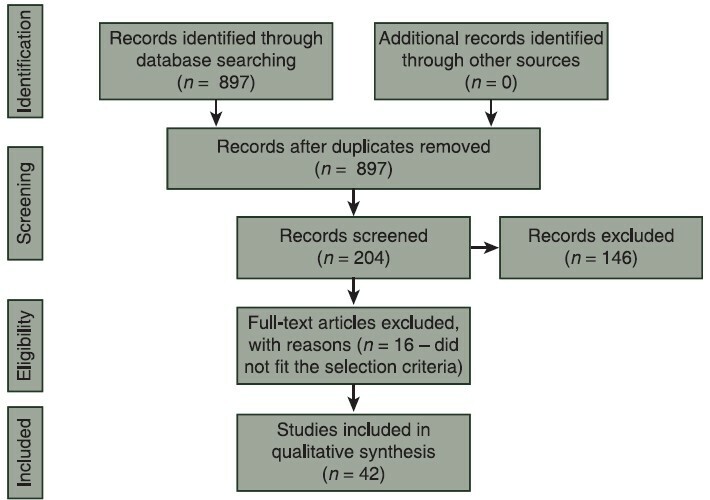 Finally, 42 articles were included in the qualitative synthesis in this review, which were then subjected to the preferred reporting items for systematic reviews and meta-analyses (PRISMA) guidelines for systematic reviews [Figure 1]. Chemical compounds in other products. Combinations of chemical and physical methods. There have been several attempts made over the past two decades to study the effect of adding chemicals such as zinc (Zn), cetylpyridium chloride and chlorine dioxide (CD) to existing essential oil (EO) mouthwashes or chlorhexidine (CHX) rinses. There have also been attempts made to assess and compare the efficacy of anti-bacterial products such as triclosan and sodium fluoride. A total of 12 studies met the inclusion criteria set by the PRISMA guideline. The results of these studies are summarized in [Table 2]. Toothpastes with chemical additives to specifically prevent the malodor have been studied in detail over the past two decades. However, only eight studies met the inclusion criteria of this systematic review; these articles are summarized in [Table 3]. There have been attempts to reduce oral malodor by adding specific chemicals to products such as tablets, gels, candies, chewing gum and lozenges. The search using the PRISMA criteria yielded 10 results, which are summarized in [Table 4]. The past two decades has seen a slew of herbal products in the market. However, we were only able to find four studies that met the inclusion criteria of this review. These articles are summarized in [Table 5]. There have been studies on the efficacy of modified mechanical methods, particularly tongue cleansing, on the reduction of organoleptic scores in patients complaining of halitosis. The search using our criteria yielded eight results. These are summarized in [Table 6]. The results of this systematic review suggest that despite the several different approaches used in the management of halitosis, mouthwashes still remain the mainstay of halitosis management. Essential oil mouthwashes are often referred to as cosmetic mouthwashes and have been the most commonly prescribed over the counter medications for halitosis. While there have been level III studies that show that EO mouthwashes are better than water, almost all other chemical mouthwashes have been documented to have a greater reduction in malodor. Studies show that CHX, ,, Triclosan and cetylpyridinium chloride are all significantly better than EO mouthwashes at reducing oral malodor. While there was some initial support for the use of CD in the management of halitosis,  there is an inadequate level I or level II evidence to support the use of CD as an agent against halitosis. The brushing of teeth has always been seen as an effective method of reducing halitosis, however few studies with the level I or level II evidence were found in the literature. Level II evidence existed for products such as hinokitiol. Abrasive microcapsules (Breezy candy)  and tablets containing bovine lactoferrin and lactoperoxidase. Tablets and candies with other products have also been documented. Tian et al. showed that allyl-isocyanate combined with Zn salts chewing gum was found to reduce VSC by 89% after chewing;  while Nohno et al. showed that candy tablets containing protease and actinidine showed a significant reduction in VSC. Zhu et al. showed that salivary anaerobes were significantly lower in subjects who chewed gum that contained cinnamic aldehyde. While Iwamoto et al. showed a significant reduction in halitosis parameters in those subjects using lactobacillus salivarius with xylitol tablets  for 2 weeks. Greenstein et al. showed that oxidizing lozenges showed a significant reduction in malodor  of the dorsal surface of the tongue. However, it must be remembered that all these products had only level III evidence and no randomized control studies exist to support their efficacy. While mechanical methods form the backbone of oral hygiene, the modification of mechanical methods specifically for combating malodor remains a debated field with little detailed evidence. The fact that no randomized control trials with a large multicenter sample (level I evidence) were found in this systematic review is an interesting finding; however, there were several studies with level II. Of the different methods that have been studied there have been many that have focused on the use of modifications of tongue scraping. Olivier-Neto et al. showed that a tongue scraper attached to the back of a toothbrush was able to significantly reduce bad breath for up to 2 h  while Erovic-Ademovski et al. showed that organoleptic scores were significantly lower following active rinse combined with tongue scraping compared to rinsing alone. Faveri et al. showed that tongue scraping was the most effective method of reducing organoleptic scores compared to other oral hygiene methods without tongue scraping. The above control studies support the initial findings of Seeman et al. who showed tongue cleaning was effective in reducing organoleptic scores. These studies are in contrast to the findings of Haas et al. who showed that there was no effect of tongue scraping on organoleptic scores;  however, it must be noted that this was not a randomized control study. The results of this systematic review suggest that while there are several physical and chemical methods available to combat oral halitosis, the use of mouthwashes and dentifrices remain the mainstay of halitosis management. There is currently insufficient amount of level I evidence to support the efficacy of herbal products or mechanical modifications to oral hygiene practices and there is a need for a greater number of randomized controlled trials to study the efficacy of these methods. Lee SS, Zhang W, Li Y. Halitosis update: A review of causes, diagnoses, and treatments. J Calif Dent Assoc 2007;35:258-60, 62, 64. McKeown L. Social relations and breath odour. Int J Dent Hyg 2003;1:213-7. Erovic Ademovski S, Lingström P, Winkel E, Tangerman A, Persson GR, Renvert S. Comparison of different treatment modalities for oral halitosis. Acta Odontol Scand 2012;70:224-33. Masuo Y, Suzuki N, Yoneda M, Naito T, Hirofuji T. Salivary β-galactosidase activity affects physiological oral malodour. Arch Oral Biol 2012;57:87-93. Scully C. Halitosis. Clin Evid (Online) 2014;9:1305. Brunner F, Kurmann M, Filippi A. The correlation of organoleptic and instrumental halitosis measurements. Schweiz Monatsschr Zahnmed 2010;120:402-8. Tamaki N, Kasuyama K, Esaki M, Toshikawa T, Honda S, Ekuni D, et al. A new portable monitor for measuring odorous compounds in oral, exhaled and nasal air. BMC Oral Health 2011;11:15. Tsai CC, Chou HH, Wu TL, Yang YH, Ho KY, Wu YM, et al. The levels of volatile sulfur compounds in mouth air from patients with chronic periodontitis. J Periodontal Res 2008;43:186-93. Dadamio J, Van Tournout M, Teughels W, Dekeyser C, Coucke W, Quirynen M. Efficacy of different mouthrinse formulations in reducing oral malodour: A randomized clinical trial. J Clin Periodontol 2013;40:505-13. Thaweboon S, Thaweboon B. Effect of an essential oil-containing mouth rinse on VSC-producing bacteria on the tongue. Southeast Asian J Trop Med Public Health 2011;42:456-62. Wilhelm D, Gysen K, Himmelmann A, Krause C, Wilhelm KP. Short-term effect of a new mouthrinse formulation on oral malodour after single use in vivo: A comparative, randomized, single-blind, parallel-group clinical study. J Breath Res 2010;4:036002. Wigger-Alberti W, Gysen K, Axmann EM, Wilhelm KP. Efficacy of a new mouthrinse formulation on the reduction of oral malodour in vivo. A randomized, double-blind, placebo-controlled, 3 week clinical study. J Breath Res 2010;4:017102. Carvalho MD, Tabchoury CM, Cury JA, Toledo S, Nogueira-Filho GR. Impact of mouthrinses on morning bad breath in healthy subjects. J Clin Periodontol 2004;31:85-90. Quirynen M, Avontroodt P, Soers C, Zhao H, Pauwels M, Coucke W, et al. The efficacy of amine fluoride/stannous fluoride in the suppression of morning breath odour. J Clin Periodontol 2002;29:944-54. Borden LC, Chaves ES, Bowman JP, Fath BM, Hollar GL. The effect of four mouthrinses on oral malodor. Compend Contin Educ Dent 2002;23:531-6, 38, 40.
van Steenberghe D, Avontroodt P, Peeters W, Pauwels M, Coucke W, Lijnen A, et al. Effect of different mouthrinses on morning breath. J Periodontol 2001;72:1183-91. Frascella J, Gilbert RD, Fernandez P, Hendler J. Efficacy of a chlorine dioxide-containing mouthrinse in oral malodor. Compend Contin Educ Dent 2000;21:241-4, 46, 48. Frascella J, Gilbert R, Fernandez P. Odor reduction potential of a chlorine dioxide mouthrinse. J Clin Dent 1998;9:39-42. Kozlovsky A, Goldberg S, Natour I, Rogatky-Gat A, Gelernter I, Rosenberg M. Efficacy of a 2-phase oil: Water mouthrinse in controlling oral malodor, gingivitis, and plaque. J Periodontol 1996;67:577-82. Young A, Jonski G. Effect of a single brushing with two Zn-containing toothpastes on VSC in morning breath: A 12 h, randomized, double-blind, cross-over clinical study. J Breath Res 2011;5:046012. Payne D, Gordon JJ, Nisbet S, Karwal R, Bosma ML. A randomised clinical trial to assess control of oral malodour by a novel dentifrice containing 0.1%w/w o-cymen-5-ol, 0.6%w/w zinc chloride. Int Dent J 2011;61 Suppl 3:60-6. Chen X, He T, Sun L, Zhang Y, Feng X. A randomized cross-over clinical trial to evaluate the effect of a 0.454% stannous fluoride dentifrice on the reduction of oral malodor. Am J Dent 2010;23:175-8. Hu D, Zhang YP, DeVizio W, Proskin HM. A clinical investigation of the efficacy of two dentifrices for controlling oral malodor and plaque microflora overnight. J Clin Dent 2008;19:106-10. Farrell S, Barker ML, Gerlach RW. Overnight malodor effect with a 0.454% stabilized stannous fluoride sodium hexametaphosphate dentifrice. Compend Contin Educ Dent 2007;28:658-61. Sharma NC, Galustians HJ, Qaqish J, Galustians A, Rustogi K, Petrone ME, et al. Clinical effectiveness of a dentifrice containing triclosan and a copolymer for controlling breath odor. Am J Dent 2007;20:79-82. Olshan AM, Kohut BE, Vincent JW, Borden LC, Delgado N, Qaqish J, et al. 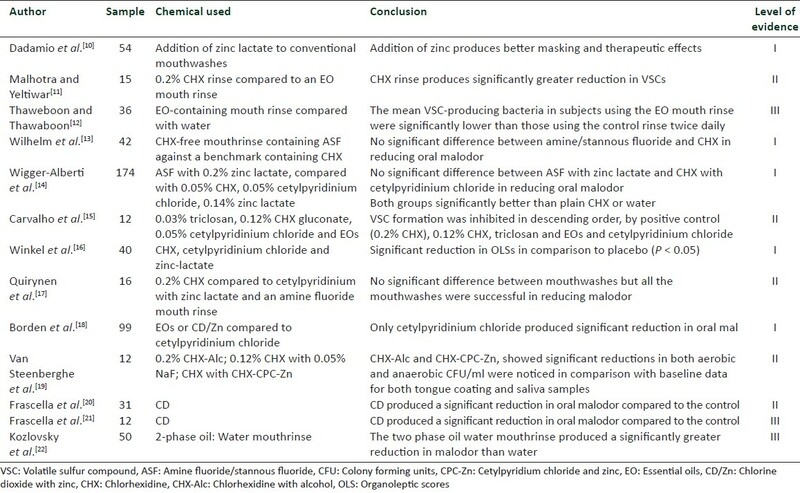 Clinical effectiveness of essential oil-containing dentifrices in controlling oral malodor. Am J Dent 2000;13:18C-22. Suzuki N, Yoneda M, Tanabe K, Fujimoto A, Iha K, Seno K, et al. Lactobacillus salivarius WB21 - containing tablets for the treatment of oral malodor: A double-blind, randomized, placebo-controlled crossover trial. Oral Surg Oral Med Oral Pathol Oral Radiol 2014;117:462-70. Iha K, Suzuki N, Yoneda M, Takeshita T, Hirofuji T. Effect of mouth cleaning with hinokitiol-containing gel on oral malodor: A randomized, open-label pilot study. Oral Surg Oral Med Oral Pathol Oral Radiol 2013;116:433-9. Tian M, Hanley AB, Dodds MW, Yaegaki K. Chewing gum containing allyl isothiocyanate from mustard seed extract is effective in reducing volatile sulfur compounds responsible for oral malodor. Am J Dent 2013;26:180-4. Porciani PF, Grandini S. The effect of zinc acetate and magnolia bark extract added to chewing gum on volatile sulfur-containing compounds in the oral cavity. J Clin Dent 2012;23:76-9. Nohno K, Yamaga T, Kaneko N, Miyazaki H. Tablets containing a cysteine protease, actinidine, reduce oral malodor: A crossover study. J Breath Res 2012;6:017107. Barak S, Katz J. The effect of Breezy candy on halitosis: A double-blind, controlled, and randomized study. Quintessence Int 2012;43:313-7. Shin K, Yaegaki K, Murata T, Ii H, Tanaka T, Aoyama I, et al. Effects of a composition containing lactoferrin and lactoperoxidase on oral malodor and salivary bacteria: A randomized, double-blind, crossover, placebo-controlled clinical trial. Clin Oral Investig 2011;15:485-93. Zhu M, Carvalho R, Scher A, Wu CD. Short-term germ-killing effect of sugar-sweetened cinnamon chewing gum on salivary anaerobes associated with halitosis. J Clin Dent 2011;22:23-6. Greenstein RB, Goldberg S, Marku-Cohen S, Sterer N, Rosenberg M. Reduction of oral malodor by oxidizing lozenges. J Periodontol 1997;68:1176-81. Sterer N, Ovadia O, Weiss EI, Perez Davidi M. Day-long reduction of oral malodor by a palatal mucoadhesive tablet containing herbal formulation. J Breath Res 2013;7:026004. Tanaka M, Toe M, Nagata H, Ojima M, Kuboniwa M, Shimizu K, et al. Effect of eucalyptus-extract chewing gum on oral malodor: A double-masked, randomized trial. J Periodontol 2010;81:1564-71. Rassameemasmaung S, Sirikulsathean A, Amornchat C, Hirunrat K, Rojanapanthu P, Gritsanapan W. Effects of herbal mouthwash containing the pericarp extract of Garcinia mangostana L on halitosis, plaque and papillary bleeding index. J Int Acad Periodontol 2007;9:19-25. Oliveira-Neto JM, Sato S, Pedrazzi V. How to deal with morning bad breath: A randomized, crossover clinical trial. J Indian Soc Periodontol 2013;17:757-61. Haas AN, Silveira EM, Rösing CK. Effect of tongue cleansing on morning oral malodour in periodontally healthy individuals. Oral Health Prev Dent 2007;5:89-94. Asokan S, Kumar RS, Emmadi P, Raghuraman R, Sivakumar N. Effect of oil pulling on halitosis and microorganisms causing halitosis: A randomized controlled pilot trial. J Indian Soc Pedod Prev Dent 2011;29:90-4. Faveri M, Hayacibara MF, Pupio GC, Cury JA, Tsuzuki CO, Hayacibara RM. A cross-over study on the effect of various therapeutic approaches to morning breath odour. J Clin Periodontol 2006;33:555-60. De Luca-Monasterios F, Chimenos-Küstner E, López-López J. Effect of chewing gum on halitosis. Med Clin (Barc) 2014;143:64-7. Wilhelm D, Himmelmann A, Axmann EM, Wilhelm KP. Clinical efficacy of a new tooth and tongue gel applied with a tongue cleaner in reducing oral halitosis. Quintessence Int 2012;43:709-18. Seemann R, Kison A, Bizhang M, Zimmer S. Effectiveness of mechanical tongue cleaning on oral levels of volatile sulfur compounds. J Am Dent Assoc 2001;132:1263-7. Wilhelm D, Himmelmann A, Krause C, Wilhelm KP. Short term clinical efficacy of new meridol HALITOSIS tooth & tongue gel in combination with a tongue cleaner to reduce oral malodor. J Clin Dent 2013;24:12-9. Tian M, Hanley AB, Dodds MW. Allyl isothiocyanate from mustard seed is effective in reducing the levels of volatile sulfur compounds responsible for intrinsic oral malodor. J Breath Res 2013;7:026001.